Sixteen shady acres of dirt pathways, steeply pitched roofs on narrow buildings and even a few turrets… all signs of a medieval European village… pop up just 15 minutes from downtown Kansas City. It’s the home of the Kansas City Renaissance Festival, a.k.a. the KC Renfest. 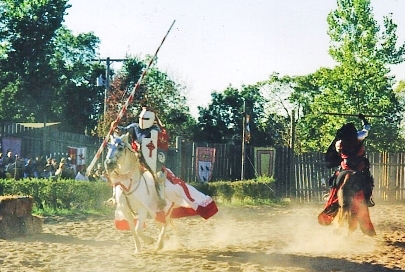 Several times a day you can watch and cheer armored knights with clashing swords on thundering horses during the jousting matches. You’ll find leather goods, jewelry, renaissance foods (one of the favorites is roasted turkey legs), and souvenir wooden swords and shields for the kids at the 162 shops in the village. You can even buy handmade suits of chain mail. Another shop sells period renaissance clothing. Enter the shop in your street clothes and walk out in a wench’s skirt, blouse and vest, or dashing clothes for a squire, sword and all. Each weekend of the festival is themed—Scottish, Irish, Pirates, Royalty, Enchantment and Middle Eastern—so you can go back and see something different each time. To get there from Kansas City, drive just one minute north of Bonner Springs exit 224 off K-7. Signs and banners show the way to free parking and the gateway to a trip 500 years into the past. You can find further information on tickets, dates, times and directions at the festival’s website: www.KCRenfest.com, or by calling (913) 721-2110.